Since it´s “formulation” at the onset of the new millennium, researchers have tried to apply Positive Psychology to organizational settings. E.g., Adam Grant promotes pro-social behavior in business settings, Amy Wrzesniewski looks at how employees can foster (perceived) meaning via job-crafting, and Jane Dutton investigates the impact of high-quality connections. Another interesting framework is offered by Fred Luthans and his colleagues. 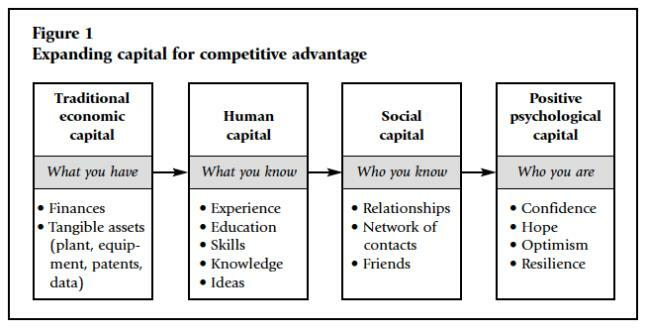 They have developed the idea of Positive Psychological Capital (PsyCap) which is seen as a valuable extension to the concepts of economic, human, and social capital (see table above; taken from Luthans et al., 2004). PsyCap is theorized as a higher-order construct that is “composed” of four underlying constructs, precisely Self-Efficacy (also called Confidence), Hope, Optimism, and Resiliency. It´s called higher-order because PsyCap is not just “made of” the underlying constructs, but taken together, they form something new, an entity that is more than the sum of its parts. Please see diagram at the bottom, based on Luthans & Youssef (2004). This shows the whole framework, precisely: the H.E.R.O. formation by which the constructs is sometimes known to the general public. What are the building blocks all about – as defined in Positive Psychology? Hope is as a positive state where our feelings of agency (goal oriented determination) and pathways (proactively planning to achieve those goals) interact. Self-efficacy is depicted as confidence in our ability to achieve a specific goal in a specific situation. Optimism is theorized as a realistically-positive view of what can or cannot do. Resilience is defined as successfully coping with adversity or stress. In organizational settings, it is characterized as the ability to “bounce back” from high workload, conflict, failure, and ongoing organizational change. 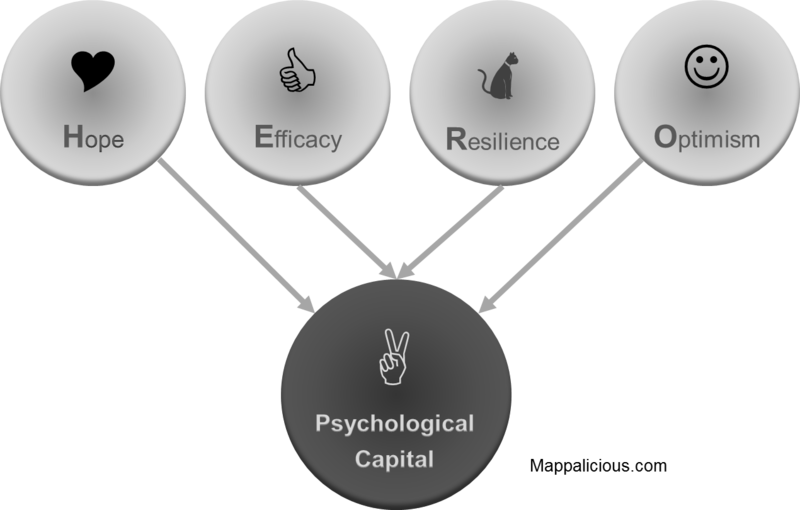 The four psychological capacities of confidence, hope, optimism, and resilience are measurable, open to development, and can be managed for more effective work performance. Why is this important? Because it means that – unlike trait-like concepts such as general intelligence – PsyCap can be developed by deliberate practice. Just the other three forms of capital, it can be built and enhanced – in a rather short amount of time, by the way (see this paper for more info). As such, it can be a very valuable tool in organizational and personnel development. Why should you care (especially if you are a CEO or HR Director)? The results indicated the expected significant positive relationships between PsyCap and […] job satisfaction, organizational commitment, psychological well-being, desirable employee behaviors (citizenship), and […] measures of performance (self, supervisor evaluations, and objective). There was also a significant negative relationship between PsyCap and undesirable employee attitudes (cynicism, turnover intentions, job stress, and anxiety) and undesirable employee behaviors (deviance).